Food -- Pineapple contains a proteolytic enzyme bromelain, which breaks down protein. Pineapple juice can thus be used as a marinade and tenderizer for meat. The enzymes in pineapples can interfere with the preparation of some foods, such as jelly or other gelatin-based desserts. The bromelain breaks down in the canning process, thus canned pineapple can generally be used with gelatin. These enzymes can be hazardous to someone suffering from certain protein deficiencies or disorders, such as Ehlers-Danlos syndrome. Pineapples should also not be consumed by those with Hemophilia or by those with kidney or liver disease, as it may reduce the time taken to coagulate a consumer’s blood.Consumers of pineapple have claimed that pineapple has benefits for some intestinal disorders; others claim that it helps to induce childbirth when a baby is overdue.Pineapple is a good source of manganese (91 %DV in a 1 cup serving), as well as containing significant amounts of Vitamin C (94 %DV in a 1 cup serving) and Vitamin B1 (8 %DV in a 1 cup serving). 1.Steep all glurinous rice in the water for one day. 2.Clean pineapple and cut into two parts then remove pulp. 3.Juice half of pineapple pulp,chop other half of pineapple pulp. 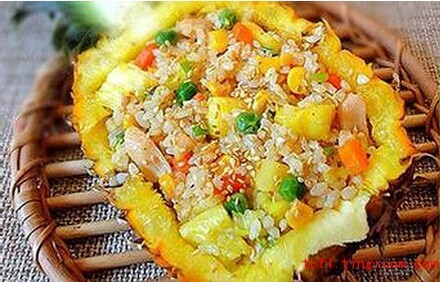 5.Fill pineapple skin with stuffing, fully assembled in two parts. 6.Steam it at least 50 minutes,dish off. 1.Glutinous rice must be soaked one day ahead of schedule. 2.when digging the pineapple cup,you can not force general had dug it broken, as far as possible to stay around in some of the flesh. 3.If you’re afraid of not fully cooked rice,I talk about a good idea. 5.Steam stuffing with sweet corn,pea and Chinese berry about 40 minutes or until well done.